Earlier today I posted a cookbook review of Smoking Hot & Cold by Charlotte Pike. 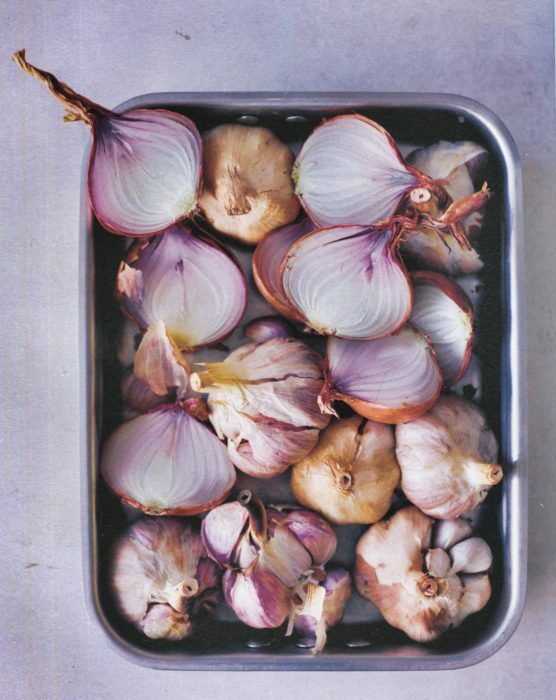 Here’s the recipe I fell in love with: smoked onions [and some garlic, too, in the picture]. What to do with them? They keep in your refrigerator for up to a week. You can just eat them, of course, but they are flavor amplifiers when added to soups or stews or sauces or salads. And, in a few days, I’ll post a Smoked Onion Tart with Spinach, Blue Cheese, and Sage that is divine. To smoke the onions more quickly and to impart a fuller smoky flavor, cut the onions in half vertically, through the root with the skin on. For a more gentle flavor or a slower smoke, leave the onions whole—skins can be left on or removed; I prefer to leave them on. To halve the onions, cut them vertically (as opposed to around the equator) through the root with the skin on. There is no need to do any more to prepare your onions unless you would like to remove the skin. If you have halved the onions, gently brush or rub the olive oil over the cut surface. Season with salt and pepper and set aside. Whole onions can be smoked as they are. Preheat your hot smoker with the wood chips inside. When the smoker is at about 195°F, add the onions and smoke for 20 to 50 minutes until the onions are smoked to your liking. Start with a 20-minute smoke and experiment from there. Store the onions in the fridge in an airtight container for up to 2 days before using.